It’s a thrill to welcome the super talented author Di Bates who was awarded The Lady Cutler Prize for distinguished services to children’s Literature in 2008. She has published more than 100 books in many different genres, including picture books, chapter books and young adult. 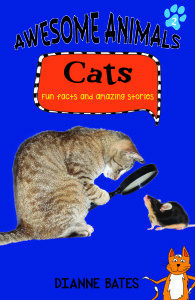 Here is the inspirational story of how her latest two non fiction books, AWESOME CATS and AWESOME DOGS were published. 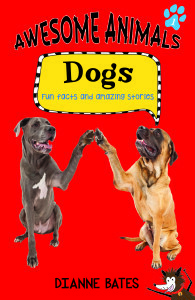 Di Bates: Working with Australian publisher Big Sky Publishing to produce my two latest books, Awesome Cats and Awesome dogs has been, in a word, awesome! I emailed my manuscripts in late January this year, receipt was acknowledged the next day, and them less than three weeks later I received an email from the publisher Diane Evans saying the company was interested. Submitting a manuscript and having it contracted in less than two months is something I hadn’t experienced in many years. This was the beginning of what has turned out to be a very happy journey for me. Diane Evan’s sister, Sharon, who is responsible for book promotion, has also been a blessing in the publishing process. Big Sky Publishing has its own book club (Red Gum) so my book will reach so many more children than would be possible with most other publishers. On top of that, Jodie Bennett, who also works with the Evans’ sisters, has been responsible for the production and delivery of bookmarks and posters – all in full, bright colour, and like the illustrations in each of the books, beautifully designed and presented. I could not have imagined that that the Awesome Cats, Dogs and Horses’ books would turn out as brilliantly as they have. My whole experience with Big Sky Publishing from start to finish has been an author’s dream… in fact I really couldn’t have dreamed it, only hoped for it.